Owner's monogram and crest engraved on escutcheon on a pistol case. 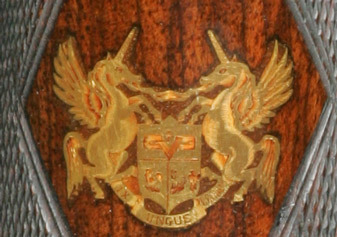 Maker's escutcheon inlaid into the underside of the forend of a Perugini & Visini bolt rifle. Escutcheon - A plate, typically of more complex outline than a simple oval, typically of brass or precious metal, inlaid into a gunstock or a gun case, upon which is engraved the initials, monogram or coat-of-arms of the owner. Or, a small protective plate with an opening at its center to protect a wood surface from damage by a movable metal part passing through it, such as the key to a case's lock or a crosspin fastener through a gun's forend.